Sonority it is - sonority without noise - which is the greatest abiding power of the string medium. In a world of sounding brass and tinkling cymbal and of noise magnified to the nth degree, this is it - sonority without noise - that marks the supreme contribution made by string music to the fund of our musical enchantment. Despite those words being spoken in 1943 by Herbert Howells in a BBC radio talk they still ring true in our world of tinkling iPods and music amplified to the nth degree. If Howells is remembered at all today it is for his sublime choral masterpiece Hymnus Paradisi. But stereotyping Howells as a choral composer is a mistake because he wrote some very fine music for strings. 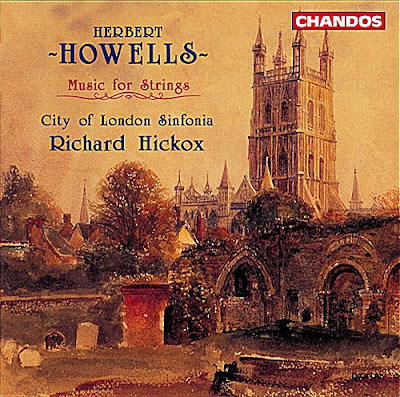 Chandos has just done us a huge favour by re-releasing a budget priced CD of Howells' music for strings with Richard Hickox conducting the City of London Sinfonia*. This includes the inexplicably overlooked 1938 Concerto for String Orchestra which was composed in the same year as Hymnus Paradisi and, like the choral work, is a tribute to Howells' only son who died tragically young. The composer acknowledges the influence of Elgar and Vaughan Williams in the Concerto but it also has more contemporary resonances, and if you like Tippett's Concerto for Double String Orchestra you will like the Howells. But, to put that comparison into perspective, bear in mind that the Tippet work was premiered in April 1940, while the Howells Concerto was given its first performance in December 1938. Sir Adrian Boult gave the first performance of the Howells with the BBC Symphony Orchestra, but it then fell out of the repertoire until Sir Adrian revived it in a Hallé concert in 1974. Much is being made elsewhere of the problems associated with transferring curatorship of EMI's classical catalogue to Warner, but little is being made of the magnificent endeavours of a few dedicated classical adepts to keep treasures from the EMI catalogue available; the results of their endeavours include the Boult 11 CD From Bach to Wagner box which I wrote about last year. My recent post about Sir Malcolm Sargent generated a surprising amount of interest and now my EMI/Warner source tells me - sorry, but I can't resist saying you read it here first and not on Sinfini Music - that in February 2014 an 18 CD box of Sargent recordings is being released. My source, who knows a thing or two about classical music, says these remastered discs should prompt a serious reassessment of Sargent's reputation. But the committed folk who are working on the remastering are also making an appeal to Overgrown Path readers. Does anyone have a complete set of the 1948 Sargent Elijah 78s as the transfer engineer is missing a few sides? Let's keep rejoicing, because there is more good news: next month (September) EMI/Warner are releasing another Boult box which brings together all his remaining EMI recordings including some not previously transferred to CD; the list of composers includes Holst, Parry, Simpson, Bliss, Tchaikovsky, Rimsky-Korsakov and, synchronistically, Howells. And even better news: this new box contains Sir Adrian's 1974 recording of marches for orchestra (Sousa, Coates, Alford etc) made with the London Philharmonic, a legendary disc that has been out of the catalogue so long it has become a collector's item. Which brings this path full circle as those marches for orchestra are another fine example of the great abiding power of sonority without noise. * Trying to help record companies sell their wares is frustrating. I try to avoid linking to Amazon to help independent retailers, but the Howell's Music for Strings is still listed on the Chandos website as a full-priced CD, which is what I have linked to and which provides my header image. Not the first time, incidentally, that I have been frustrated by the Chandos website. Great re-release guys, but could you make it easier for customers to buy it? One site I looked at stated that Howell's music appears in 12 boxed sets and on 327 individual CDs. How many of these discs are dedicated to his music I don't know, but on another site I noted six discs devoted to his organ music, so it would be reasonable to suppose a significantly greater number consisting of his choral works. I mention this because I can think of no finer place or opportunity to pay tribute to a moving force behind many recordings and in general keeping Howells in the minds of music lovers. His daughter was the distinguished actress, Ursula Howells (1922-2005). As Howells succeeded Holst at St. Paul's Girls School and Ursula was thus a pupil there, he was undoubtedly also her teacher. A bit of trivia: Dame Celia Johnson played in the orchestra at the school under Holst. Though only 14 years at the time, Ursula encouraged her inconsolable father to find in his music an outlet for his grief over the death of his son from polio in 1936. He worked for three years on a choral work, leaving it unnamed and unfinished. Commissioned to write a choral work in 1950, he completed that work and named it Hymnus Paradisi. But to the essence of the matter, in 1983 Ursula founded the Herbert Howells Society and at that time and after subsidized personally recordings of his music. Before her death in 2005, she arranged for the creation of the Herbert Howells Trust. This was to receive all royalties and performing rights fees, to be used to fund recordings, publications, the education of promising music scholars,etc. One recording I noted was funded by the Trust is of his Requiem; A Sequence for St. Michael; and Take him, Earth, for cherishing, the last commissioned for a service in Washington following the death of John Kennedy. I also noted recordings on independent labels such as Centaur, Priory, and Herald which I think it likely were funded by the Trust. It is difficult to know without being able to get at the back covers. Herbert Howells wrote glorious music, and it is right to acknowledge the labour and funds his daughter put into keeping it before the public. And also that, as a schoolgirl, she inspired him to compose what would become the Hymnus Paradisi. She in turn would certainly have loved your post. Given her father's words and your following sentence, Bob, I can hardly pass up mentioning that one of Ursula's last appearances was in an episode of Midsomer Murders entitled 'The Electric Vendetta'.